If you were to spend a day with me you’d notice pretty quickly that I can be very driven, focused and determined when it comes to my work. If I set my mind to something I get it done. That’s all fine and good except I can get a little out of touch with my fitness and spiritual time. And that’s just what I found myself doing in July and August. 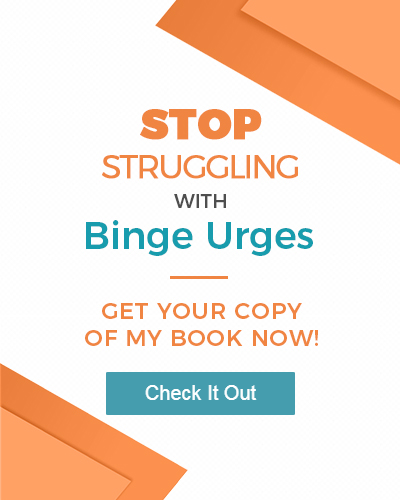 To launch my Spiritual Warrior Mentoring, host Bulimia Awareness Day and a webinar in there somewhere – oh and I’m also writing another ebook – took a ton of hours. Hours that I didn’t spend with my family, my favorite hiking trails or just on the couch relaxing. I realized that I was pressing too hard and decided at the end of August that the way I’ve been going about things just isn’t working for me. I was left exhausted, spiritually limp, and disheartened by working so hard. I also caught myself focusing on the 5-10% of things that weren’t awesome in my life while ignoring the 90-95% of things that were freaking awesome. There are so many things in my life to be thankful for and appreciate I can hardly find the words or time to reflect on them all. And herein lies the gift. The gift (or lesson) for me is that all of this work and results are fine and good, but at the price of my spiritual connection, my health and well being, my sense of joy wasn’t worth it. So I took a step back last week and realized I was doing it MY way and it’s not producing the results I want. Because, the life I want is one of ease, peace and fun. Not work, work and work. Seems like what we all want and yet I was taking on that I had to produce the results I wanted. The phrase “If it’s meant to be it’s up to me” kept popping up while I was working so hard. Our thoughts create feelings which we act up (or don’t act which is still action) and that creates results. I was spending a lot of time in the ACTION space and not enough time in the thoughts and feelings space so my results were only what I was able to produce by myself. When I activate my feelings and listen to my emotional guidance system, my inner being, and follow the path my inner being leads me to I’m working in harmony with Source and things start to be lined up for me. When I get my vibration, attitude or feelings activated and amplified to a match to what I want the Universe brings cooperative components to me. This has been a really long explanation and you’re probably wondering what the hell all of this has to do with the topic of this post – My September Vision Board. Well, after stepping back and looking at my results I realized that in order to have different results tomorrow and the next day my work isn’t so much physical as it is vibrational and emotional. I need to line up with me! 1. Create a theme for the month and then craft a vision board. Yes! This month’s theme is balance and joy. I remembered what I most want in my life (ease and fun…and definitely some travel) so I collaged a mini vision board to remind me each day when I look at it this month that I’m all about balance and joy. 2. Choose things that support this theme. I have the theme of joy and balance playing in the background of my mind and as I’m going about my day. When I look at my to-do list, the people in my life, the decisions I have to make I check in with my theme and my inner emotional guidance system and make sure the things I choose to do are aligned with it. 3. Revisit my schedule. I took a look at how much time I was putting in to work and decided if I was going to have balance it was up to me to determine what the priorities would be and how much time each would get. I reworked my work hours, added in exercise time (and exercise that meets my balance and joy meter, not hard work exercise) and committed myself to meditating twice a day for 15 minutes. That’s something I’ve been longing to do for a loooong time. Well, my theme is joy and meditating for sure brings me joy because that’s when I’m most connected to my heart center and remember who I truly am. I connect with my Godself a lot in meditation. I also have my 2012 vision board that’s on my bedroom wall. I created it out of burlap material and pinned images and phrases to it. The nice thing about that is I can add to it. I’ve been opening my mind and heart up this month to what brings me closer to joy and if I find something I’m adding it to my wall. If you’ve worked with vision boards like I have for many years you know that if it’s on the board it’ll show up in your life. It’s like placing an order with the Universe. Today’s my birthday so I wanted to share all of this because I celebrate my life, my Mom for giving me life, and you for reading and sending me your emails of support and questions. Most importantly….I am thankful for being alive. I want you and everyone in the world who is listening to know I LOVE MY LIFE! I believe in the power of my focus and that which I focus on expands. When I am appreciating my life now I will get more in my future to appreciate. I hope you’re doing some of this or will start doing this, too. It’s not hard, but it does take focus. One final thing….since I sat down to write this the sun has set over the West near my home on the Central Coast of California. It’s been absolutely spectacular to watch and I want to share it with you here to remind you to focus on the gold in your life. Let us both focus on what’s working…the 95% of life that is going fantastically and celebrate one another in a spirit of love and light.